Jason and I decided to have a pizza and beer night this past weekend. 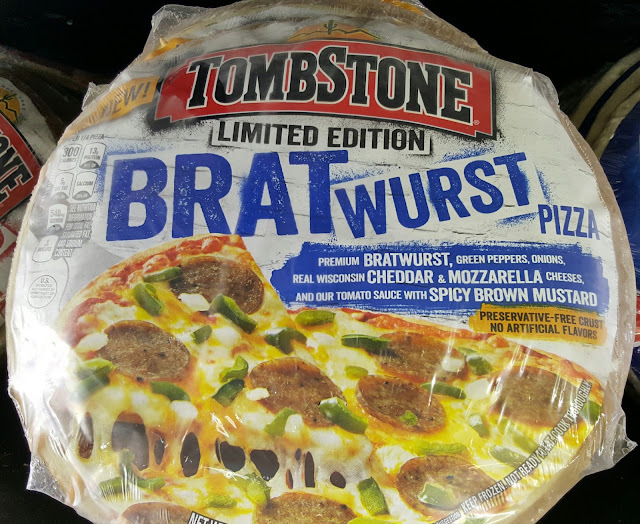 We were going to kick it off by trying the Tombstone Limited Edition Bratwurst Pizza. I wish we hadn't. At first glance, bratwurst and pizza aren't two tastes that seem to go together naturally. Especially when you get it from your grocer's frozen foods section. The main problem with Tombstone Bratwurst Pizza is that it's trying too hard to straddle the concepts of bratwurst and pizza. The bratwurst is sliced thin similar to what you'd expect from pepperoni which cuts down on the overall bratwurst flavor. It gets overwhelmed by the cheese, sauce peppers and onions. And. a note about the sauce: I see what Tombstone is doing here. They're trying to make the tomato sauce taste a bit like ketchup so they it'll go well with their spicy brown mustard. It doesn't work. Overall, Tombstone has an interesting concept with their Bratwurst Pizza, but they need to revert back to their traditional sauce and make their bratwurst slices thicker. For my money, we should have gone with the Tombstone Diablo Pizza instead. Maybe next time.